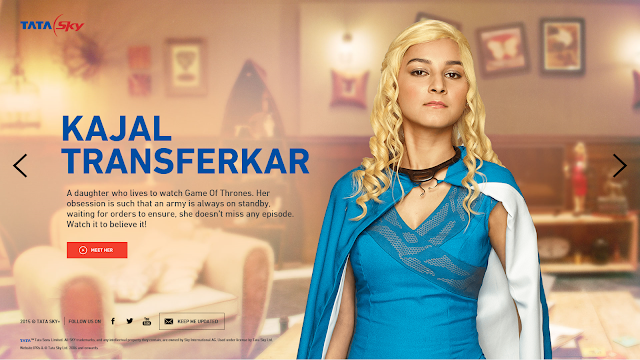 Tata Sky, one of the leading DTH service providers in India, recently launched an innovative solution Tata Sky+ Transfer for avid users who want to stay updated with their favorite TV shows anytime, anywhere. The product targeted at metro and Tier 1 cities, is a Wi-Fi enabled set-top box and digital video recorder which can transfer recorded television content to a customer’s personal device including a smartphone and tablet directly through the Tata Sky app. The brand created a pre-launch teaser campaign microsite which I found really compelling. This is a great example of storytelling done right. To establish need, Tata Sky has created personas of typical TV content addicts in a family, called the Transferkars, where different members like different kinds of content and are competing for the TV remote. The characters have been defined visually and through fun teaser videos published on YouTube. The idea packs a punch and the execution is just right.